It has been a pretty gloomy week on various levels so let’s lighten up things with a bit of fashion and it’s fridYEAH after all… I really love this all black look I posted on Instagram, and it’s pretty much my go-to outfit at the moment. It’s fashionable, comfy, easy to pull together with a hint of fashion. 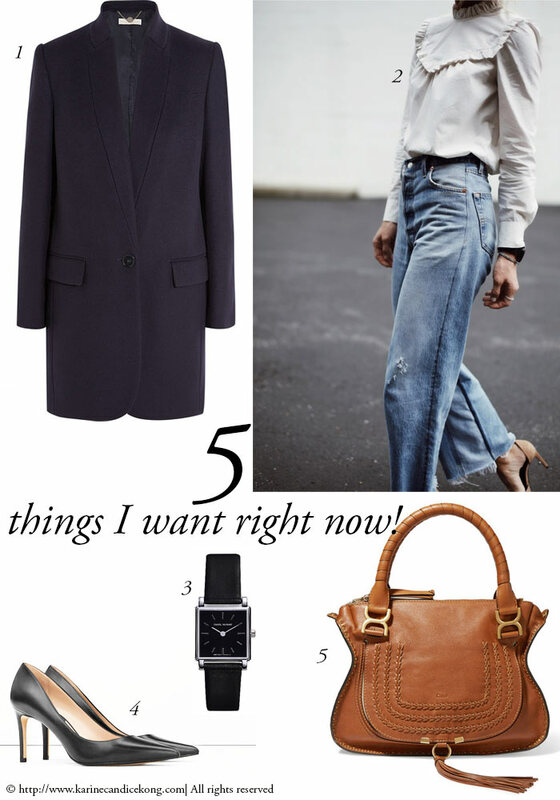 I usually pair it with an oversized coat and if the weather gets warmer, swap my black jumper for a white tee-shirt. Voilà, job done! As I’m writing this, my poor body is aching from yesterday’s surfing. Yet, I had such a ball… Carrying my board to the beach strapped in a tight wetsuit was all worthwhile when I stood up and took a few waves. Forgetting my swimsuit on Wednesday turned out to be a blessing in disguise, as it was only three of us on Thursday (instead of 40 kids) and all women 35+ with the same desire to learn and have fun. It was so awesome that I’m very much looking forward to go out in the ocean again this weekend, once my body has recovered a bit. 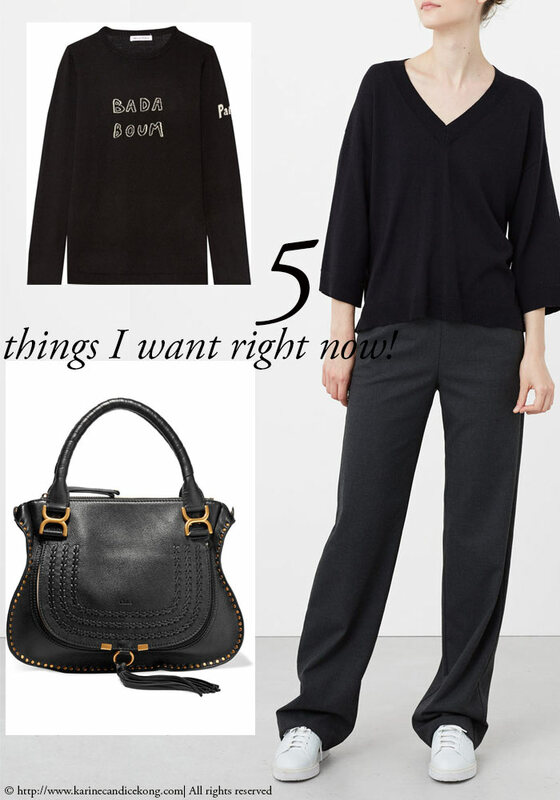 With a beaming smile on my face, I’m kicking off today’s 5 Things I want right now! with my first denim jumpsuit of the 2016. I could go on and on about jumpsuits, it is such a versatile piece of clothing and one that I really really love. 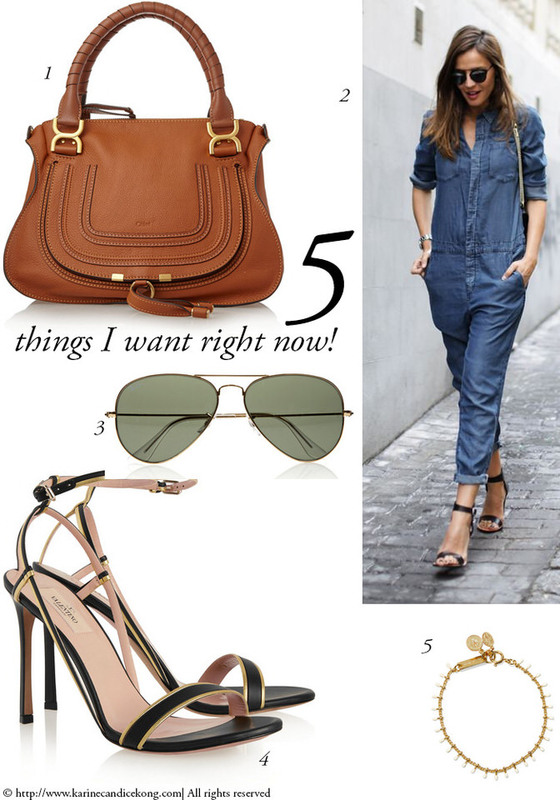 The good news is that jumpsuits are not going anywhere and if you haven’t given it a go yet, now is the time! How has your week been so far? Mine has been good…and interesting. I took good care of myself, went to the hairdresser and frankly after three weeks of living under a rock, I feel and look human again but what I thought was interesting was how things were changing for me. I did two things that I would have never done before dad’s death.